Paragraphs are an essential element of running text. They divide the content into logical, digestible bits, organizing the information, which in turn helps keep the reader engaged. Several ways of formatting paragraphs are widely used. While all function to provide a visual separation, each treatment works slightly differently to emphasize, solidify, and enhance the layout and overall goals of the design. One of the most common paragraph indicators is the basic indent. This method effectively draws the eye to the beginning of each paragraph without causing a major disturbance to the flow of text. The basic indent is almost standard for lengthy text, such as books, magazines and periodicals, as it maintains the overall color and texture of the typography while being space-economical. The depth of the indent should be in proportion to the width of the column, usually somewhere between 1/4 and 1/2 inch for an “average” text column width in print. Don’t rely on the default tab setting, but instead determine the optimum indent, and set accordingly. NOTE: Since an indent serves to separate a paragraph from the preceding one it, it is unnecessary to indent the very first paragraph of a piece. A) The basic indent is found in most books, newspapers and magazines. It is clean, simple and space-economical. B) Using extra space to separate paragraphs works well for shorter lengths of text, both in print and on the Web or mobile devices. Separating paragraphs with a line space (or less) is the other frequently used method. It provides a strong visual prompt that can be useful in instances that benefit from the addition of “breathing room” to either enhance readability, or to support the overall layout and design. This technique does tend to break up the flow of the text, so should therefore be reserved for shorter text settings that will benefit from the additional emphasis. Note that it is unnecessary, and considered poor typographic form, to use both added space and an indent, as it is redundant and visually jarring. C) An extreme indent can provide an interesting geometric shape on a page of text. D) The outdent is an even more distinctive and dramatic effect. Depending on the depth of the indent and the length of the text, this can take up a lot of text space. This approach takes the basic indent a step further by employing a deeper indent, which gives a more noticeable paragraph signal. An extreme indent can be set to any depth – even mid-column or more – and be applied to one or more lines. This technique produces a geometric text shape of sorts, which can provide a striking element in an otherwise unremarkable type treatment. 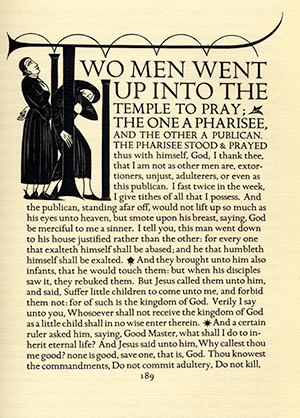 The use of ornament to separate paragraphs in running text can add balance as well as decoration, as shown in this page from the Golden Cockerel Press edition of The Four Gospels. A graphic element between continuous paragraphs can serve as an elegant separator. Color can be added for even more emphasis and definition. 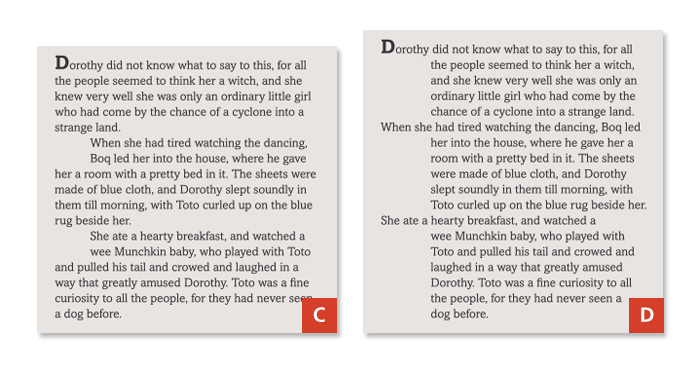 This technique can create a pleasing block of text that is decorative and functional without the interruption of indents and line spaces. Centering a graphic element within a line space can heighten the sense of typographic drama and importance. The element(s) can be larger and more detailed, such as a flourish or a series of symbols or ornaments. 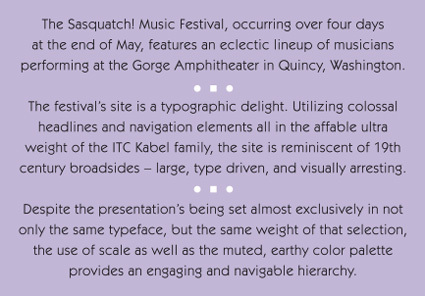 A string of reversed centered dingbats complements the typeface and content of this example. Prior to beginning your paragraph formatting exploration, carefully review your objectives, as not all techniques are suitable for every usage. Be sure to consider the medium you are designing for, as designing for print has different considerations than the Web and other devices.